I don’t know why I even bothered touching another dreaded free to play mobile game after swearing them off forever. I guess I just liked the look and theme of this one and figured maybe a company like Bethesda could deliver something a bit more substantial and a whole less soul-devouring than your standard Puzzle Quest type deal, and I suppose they did to a very limited extent. I have to give Elder Scrolls – Blades credit for a few things like its high quality production values, responsive controls, and doing a better job than most of disguising the fact that this, like all free to play games, is ultimately just looking to force you into spending money. 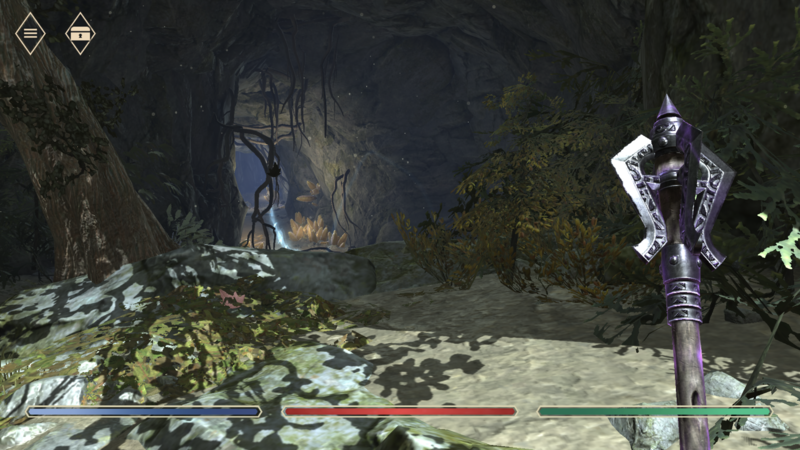 It all seems fun enough at first, offering up a very streamlined set of familiar Elder Scrolls dungeon sequences for you to slash and loot your way through. In between missions you wander around the main (and only, as far as I know) town and can upgrade and build if you’ve got the materials for it. When you first start there seem to be a lot of quests and content in general, with the only real limit being countdown timers on higher level chests and building projects. Of course you can spend gems to skip these timers, and of course gems are the extremely limited secondary currency that you’ll inevitably have to buy into to continue at some point. It doesn’t seem so bad at first though. 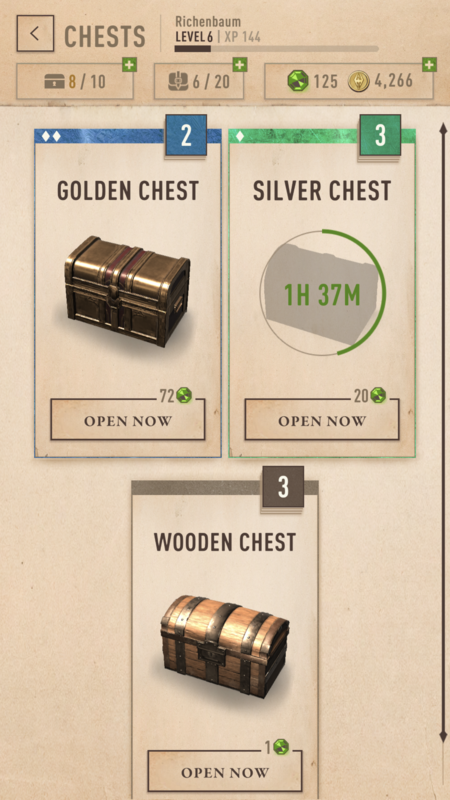 Ok, so I have to wait 3-6 hours for a fancy chest to open or a building to get built? What’s the big deal? This isn’t something I intend to be spending a lot of time on anyway, right? I played for several carefree days before the telltale signs that I was being groomed to buy gems finally began to show. The chest timers that don’t seem like a big deal at first start to become a problem as you start to gather more multi-hour chests than you can possibly open in a day, which fills up your limited chest inventory. Naturally, they want you to spend gems to increase your chest inventory too, and even worse, you can’t open other chests while one is being unlocked. Just the first of many of the games ways of herding you towards the in-game store. Your standard inventory space is also limited, and also available for gem-expansion. Again, it seems like you have a lot at first, but after a while quests start throwing really element-specific enemies at you, which means you’re going to need to start carrying around multiple sets of weapons, as well as either multiple armor sets and/or various element-enhancing/defending potions. Merchants also have limited amounts of gold each day so eventually you can’t even sell everything you find anyway. GUESS YOU BETTER BUY THAT INVENTORY UPGRADE WINK WINK! Gems can also be used in place of missing building materials too, which you’ll otherwise have to be constantly grinding the dungeons and chest-opening simulator for. Buildings are not an optional thing either by the way. You absolutely need to build and upgrade if you ever want to get better gear, potions, and etc. Hell, I had a main story mission that I couldn’t even start until my town was level 3. So you can probably see how this would start to get increasingly frustrating and disheartening, as the game just seems to move backwards, giving you more and more restrictions and less to do the more you get into it. Right now I’m at a point where I’d have to grind basic repeatable daily quests for days to be high enough level to get into the next main story quest, and those things start losing their thrill pretty quickly after a few days of seeing the same 3-4 near-identical mini-dungeons. Now I just sit here watching “your chest has unlocked” notifications pop up on my phone and not even wanting to deal with it because it’s probably just going to be more junk I don’t need, can’t even sell, and don’t much care about. I see this locked Arena Mode waiting there on the menu screen too and I, and probably everyone else that’s ever played a game like this, can probably tell you exactly how that’s going to go. The main story is going to end after a short time and the only way to continue to play and get better loot is going to be to jump into the pseudo-online-deathmatch component that’s going to require massive amounts of gems to compete in. It’s all becoming much too familiar. Again, it was a nice attempt from Bethesda, but in the end, despite the extra amount of polish, this is just another money pit and I’m getting out now before I fall in too deep. 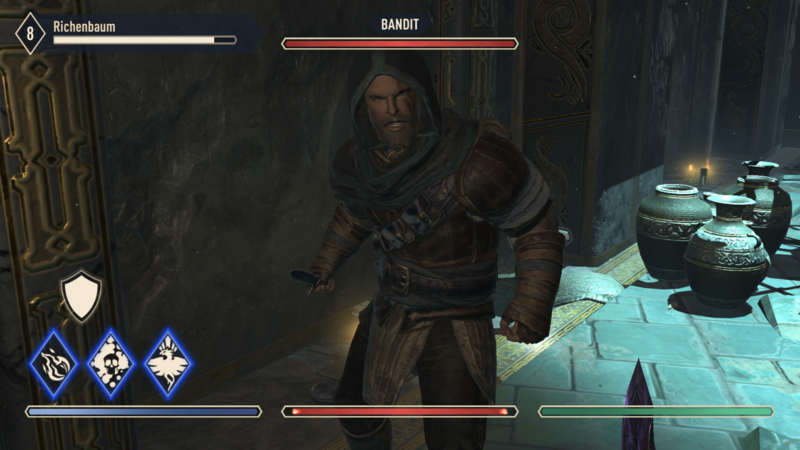 This entry was posted in Games and tagged elder scrolls blades, Games, ios, mobile.